Loughborough Library Local Studies Volunteers are opening their new exhibition at Loughborough Library on Saturday January 30th 2016. Called ‘Airships Through the Ages, Balloons to Blimps’, the exhibition is timed to commemorate the hundredth anniversary of the Zeppelin raid on Loughborough on 31st January 1916. 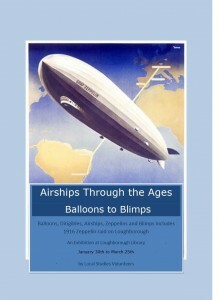 The exhibition tells the story of airships of all types, such as balloons, dirigibles, Zeppelins (including the Hindenburg), through to modern day advertising blimps. Special mention is given to the 1916 raid on Loughborough and its victims, who are due to be commemorated by a plaque in the town which the Carillon Museum is at present raising funds for. (You can read more about their appeal here). The Exhibition commences on January 30th and is open until March 25th. There is free entry to the public during Library opening hours.